-Keep your readings in one place with Adjustable Bookend. -The bookends are great for desktop organization to keep your space neat and tidy. -Use at home school or office.Organizes your school desk, executive desk, or home office work space. 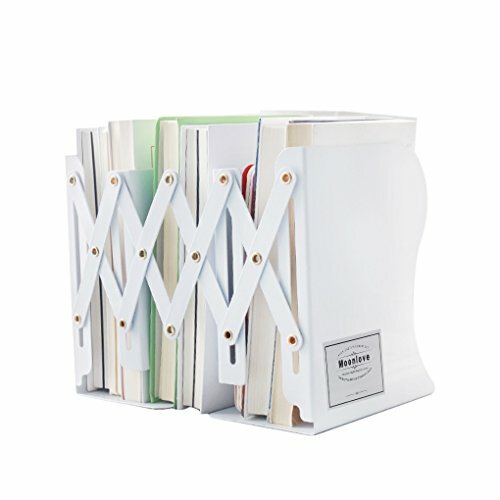 KEEPS BOOKS ORGANIZED - The unique design of these bookends securely holds your reading materials - books, manuals, directories, catalogs, magazines, files, and more. Cheerful cut-outs make these bookends perfect for children's rooms, home office, study, kitchen - anywhere you need to keep books close at hand. Place it on a desk, dresser, countertop, or shelf. DURABLE CONSTRUCTION - Made of heavy duty steel with a powder-coated finish, these bookends are scratch and chip-resistant.